The Marine Corps Marathon, the annual race known as the “The People’s Marathon” brings together runners from all walks of life to participate in a patriotic race and a day of family-friendly activities. The traditional Marine Corps Marathon course is 26.2 miles and the MCM10K race also allows runners of all ages to join in a shorter 6.2 mile event. The weekend includes additional events including a Health and Fitness Expo, the MCM Kids Run, and the Marine Corps Marathon Finish Festival. The Marine Corps Marathon will hold its pre-race expo at National Harbor in Prince George’s County, Maryland. VIP packages are available that include guaranteed access to the Marathon and weekend stay at the Gaylord National Resort and Convention Center. Marathon Date: Sunday, October 22, 2017. Start Time: 7:55 a.m. Due to transportation chanllengins this year, the start -line will remain open until 8:55 a.m. See the schedule of additional events held from October 28-30th below. Registration: The lottery registration is now closed. Additional marathons and events are held from March through November. See the MCM Event Series schedule. The start line will remain open for one hour to accommodate this change in Metro service. Participants should use the Pentagon Station to enter Runner's Village in the Pentagon North Parking lot. Spectators can take Metro to the Arlington Cemetery Station to view the start, or the Rosslyn Station to view the finish. For the MCM10K take Metro to the Smithsonian Station. Read more about Using the Washington DC Metrorail. Parking: Free parking is available in Crystal City at the corner of 23rd & Crystal Drive. Free parking is also available at all metro stations. Pay parking services at Pentagon City Mall in Arlington, the Ronald Reagan Building in Washington, D.C. and the Ballston Common Mall also in Arlington, VA will offer additional options. For more information about spectator parking, see a guide to Parking Near the National Mall. Free Shuttles: Shuttles will deliver "runners only" to Runners Village at the Pentagon North parking lot from 4:30 a.m. to 8 a.m. Additionally, runners-only shuttles will operate from National Harbor and the Gaylord National Resort, to Runners Village between 4:30 and 6:45 a.m. on MCM Day. Shuttles for both runners and spectators will operate between National Harbor and the Eisenhower Metro station from 6:45 a.m. to 5 p.m. With limited parking available in National Harbor throughout MCM Weekend, the MCM is providing free shuttle service to/from the Health & Fitness Expo at the Gaylord Resort on Oct.
Water Taxis: Service is available from Old Town Alexandria waterfront to the Gaylord from 10:45 a.m. to 11:15 p.m. The Potomac Riverboat Company is offering a $1 one-way discount and $2 off round-trip fare for runners boarding the water taxi during MCM Weekend – just mention ‘Marine Corps Marathon’ at the Alexandria City Marina Ticket Booth. Round-trip fare is $16 for adults and $10 for children. Uber: The MCM has partnered with Uber for a special drop-off location in the parking area near the Gaylord. Those using Uber for the first time can obtain a discount off their first ride. Just download the app on a smartphone and enter the promo code MCM2016 for a free first ride up to $15. The Marine Corps Marathon course starts in Arlington, VA on Route 110 between Arlington National Cemetery and the Pentagon, moving through Rosslyn, Georgetown, and Rock Creek Park. 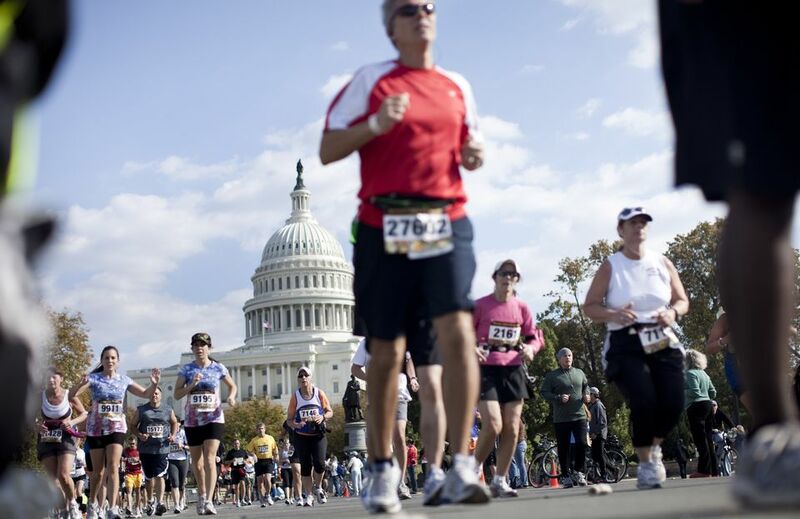 Runners and spectators enjoy impressive views of the city's most iconic landmarks including the Kennedy Center, the national memorials along West Potomac Park and the Tidal Basin, the Smithsonian museums on the National Mall, the U.S. Capitol and much more. Runners will cross over the 14th Street Bridge and the scenic Potomac River as they head back into Virginia for the last 10K. The course leads alongside Arlington National Cemetery and then finishes at the access road to the Marine Corps War Memorial. All participants must maintain a 14 minute-per-mile pace throughout the marathon as the course closes seven hours after the start. Friday, Oct. 20, 2017, 10 a.m.-7 p.m.
Saturday, Oct. 21, 2017, 9 a.m.-7 p.m.
DC Armory, 2001 E. Capitol Street SE Washington, DC. More than 200 booths and interactive centers provide information about health and fitness issues. Race participates must attend to pick up their race materials: the participant bib number, safety pins, souvenir single-use ChampionChip, a commemorative MCM patch, and a goodie bag including special giveaways. North Pentagon parking lot in Arlington, Virginia. Children ages 5-12 participate in the one-mile just-for-fun event. Pre-registration is required. The free outdoor festival includes interactive games, activities, and entertainment for the entire family. All participants receive an event shirt, keepsake bib, and medal. The start line of the MCM10K is relocating this year to the Pentagon North parking lot, featuring an entirely new course within Arlington, VA. In addition, the new start time of 9:15 a.m., will send runners along a course that mirrors the first four miles of the MCM. After running through Rosslyn, and adjacent to the MCM Finish Festival, MCM10K runners will arrive at the U.S. Marine Corps War Memorial finish. Rosslyn, Virginia. Runners will meet their friends and family and can enjoy refreshments at the beer garden and Rosslyn’s Restaurant Row. The Arlington Stage, located on Wilson Boulevard and North Moore Street, will feature live musical performances. Streets along the race route will be closed beginning at 6:50 a.m. and are expected to reopen by 1:30 p.m. Volunteers can register for responsibilities throughout the weekend at the Health & Fitness Expo, the MCM Kids Run, MCM10K, Runners Village, MCM Finish Festival and water points and food stations located along the Marathon and MCM10K course. There also are positions available for volunteers with professional skills such as HAM operators, massage therapists and those with certified medical training including EMTs, nurses, and doctors. By selecting "group registration," members of community organizations can register larger numbers of volunteers to work together during MCM events. Several groups return to volunteer at the MCM each year, including Boy Scout and Girl Scout Troops, Arlington County, the Junior League of Washington, numerous charity groups and employees of Navy Federal Credit Union, UPS and Walmart.